The above claim is based a Board decision at the December 10, 2013 Board meeting to have the Parks Commission ‘refrain’ from making an offer to a potential caretaker for the Lost Lake Park. This individual was the choice of the Parks and Recreation Commission. The Board’s concern was the potential liability of extending this job to the recommended person since the family had young children. Fortunately, the Parks Commission had performed their ‘due diligence’ in getting input from the Township’s Insurance company as well as the Park Commission’s Attorney, and proceeded with their selection. Had the Park’s Commission rejected the selected caretaker based on the Township Board’s concern, the Township could have been charged with violating the Elliot Larson Act for using familial status as a reason for not hiring the caretaker. The Township’s disregard of and seeming inability to comprehend its FHA obligations is systematic and pervasive as evidenced by the following illustration. The Township owns a park with a house on a lake. For years the Township leased the house to a caretaker who lived in the house and maintained the house and park. In 2013 the Township Parks and Recreation Department hired a new caretaker and as usual agreed to the caretaker’s occupancy of the house. Treasurer Langlois: Move that the Board make a review of that potential situation [a lease of Twp property to a Family with Minor Children]…and make a motion to authorize the Township Supervisor to formally request that the Parks and Recreation Commission refrain from entering into a caretaker contract until the liability issues can be reviewed by the Township insurance agent and Township legal counsel. Trustee Bailey: Is this the first that you’re aware of that we have done such a thing [lease to a family with minor children]? Treasurer Langlois: Yes, I understand there was a caretaker in the past, there were no minor children that I know of and then the initial approval recently was for a new caretaker that did not involve a family with minor children and when that fell through this apparently prompted the Parks [commission] to look at family with 2 very small children. Trustee Bailey: How small are they? Treasurer Langlois: Six and two. The Langlois motion was approved unanimously. No Board Member mentioned the protection of families with children against housing discrimination under Federal and Michigan law. No one ventured a thought as what this action’s impact on the caretaker and his family. The caretaker would be deprived of both housing and employment. The Board wondered whether their insurance rates might be affected. They did not consider that children play in the park everyday. The Board thoughtlessly assumed that landlords of properties fronting Michigan’s 11,000 inland lakes and thousands of miles of Great Lakes shoreline are exempt from Federal and Michigan laws prohibiting discrimination against families with children. The foregoing episode illustrates the current Township Board’ impenetrable indifference to its fair housing obligations. To its credit the Parks Commission ignored the Board. Here is a copy of the Michigan Elliott-Larson Civil RIghts Act. Why is this important to the citizens of Oakland Township? Only the court will determine if the example shown above will have an impact on the final decision regarding Blossom Ridge. However, another conclusion can be made from this example. Ever since early 2013, the Township Board and the Parks and Recreation Commission have had separate law firms providing legal guidance. The decision by the Parks Commission to retain their own counsel was based the Board’s confrontational actions toward the Parks Commission (some of which are involved in legal actions BETWEEN the two elected bodies). Trustee Thalmann consistently points out, during her “Trustee Comments” at Board meeting, the legal expense that the Parks Commission has incurred for the month. The contract with the Board’s legal team technically includes legal support for the Parks and Recreation Commission. She claims that the Park’s legal expenses are not necessary, since they would be covered by the contract with the Board’s legal team. It should be pointed out the the Board’s legal team did not advise the Board against making their December 10, 2013 motion. It appears that the Parks Commission’s legal counsel, and the decision by the Parks Commission to proceed with extending the offer to the family with children, may have prevented the Township from a lawsuit involving a Elliott-Larson civil rights violation. Oakland Township’s legal expense has increased dramatically since the new Board has come into office. The legal fees incurred by the Parks Commission are totally eclipsed by the legal fees incurred as a result of lawsuits our Township is involved in since the new Board took office. The Township should be grateful for the actions taken by the Parks and Recreation Commission based on the legal advice from their separate legal counsel. This entry was posted in Board vs. Blossom Ridge, Board vs. Parks, Legal Problems and tagged Blossom RIdge, Board vs. Parks, discriminatory practices, Jeanne Langlois, Maureen Thalmann, Mike Bailey, oakland township, Oakland Township Board, Trustee Thalmann on December 18, 2014 by richardjmichalski. We need your help! Supervisor Gonser does it again! If you have been following the information we have been sharing regarding the behavior of Supervisor Gonser, the information included in this post will come as no surprise to you. However, it has now reached the point where the citizens of Oakland Township need to express their opinions on his inappropriate, unauthorized decisions. The most recent incident involves a decision he made on the possible use of park land. His action is consistent with his desire to control the, separately elected, Parks Commission. After reading this, if you find his behavior unacceptable and are concerned about the impact of this pipeline on our park, we invite you to the December 9th Oakland Township Board meeting at 7 PM and let the Board know your position. It is not officially on the agenda, but some Board members may add it. If it is not placed on the agenda, you will still be able to provide your input during the ‘citizen comments’ section of the meeting. At the November 12, 2014 Parks and Recreation Commission (PRC) meeting, Chris Hawthorne, an employee of EnSite who represents Vector Pipeline, gave a presentation describing a proposal to install a 42 inch diameter high pressure gas line (up to 1000 psi) through our Township. This pipeline is intended to transmit natural gas from Illinois, through Indiana and to Canada. 95% of the pipeline route through the state is intended to follow an existing pipeline and utilize the currently approved rights-of-way (ROW’s already going through our Township). 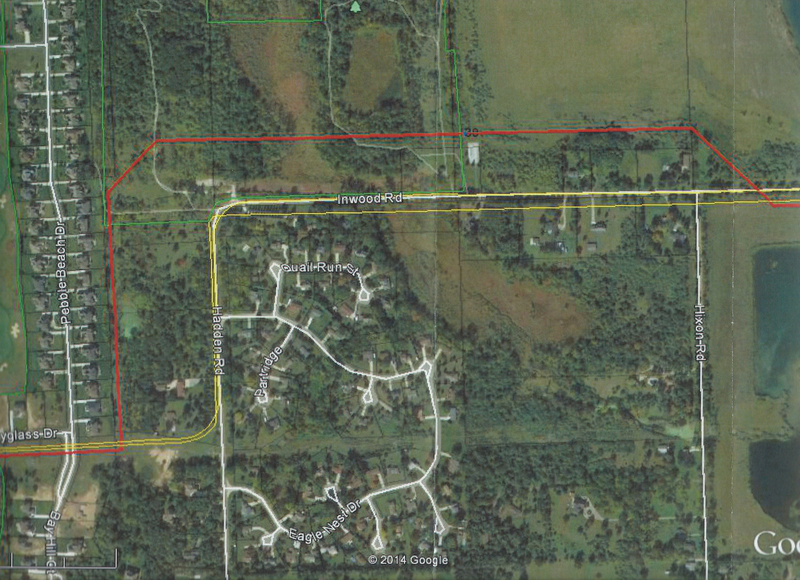 Vector Pipeline wants to deviate from the existing right-of-way in one area of our Township by putting the pipeline through Draper Twin Lakes Park. The stated reason for the deviation was that installing the pipe through the existing right-of-way was “extremely tight”. They were asking permission from the Parks Commission to survey the land to determine the feasibility of routing the pipeline through the park. During questioning, the representative stated that all Supervisors in the affected communities had previously been contacted regarding this project. The Parks Commission members were not aware of any previous communication on this issue. When PRC chairman Zale asked if any Commission members would like to make a motion to approve the request, there was silence. As a result, the request was denied. The Parks Commission did not approve the request on the basis that the park land has deed restrictions that prevent the pipeline from going through it. A few days later, parks personnel observed individuals from EnSite USA surveying Draper Twin Lakes Park. Upon further investigation, Mr. Harthorne indicated that after he did not receive permission to perform the survey from the PRC, he contacted Supervisor Gonser, and Supervisor Gonser gave him permission to do the requested work. 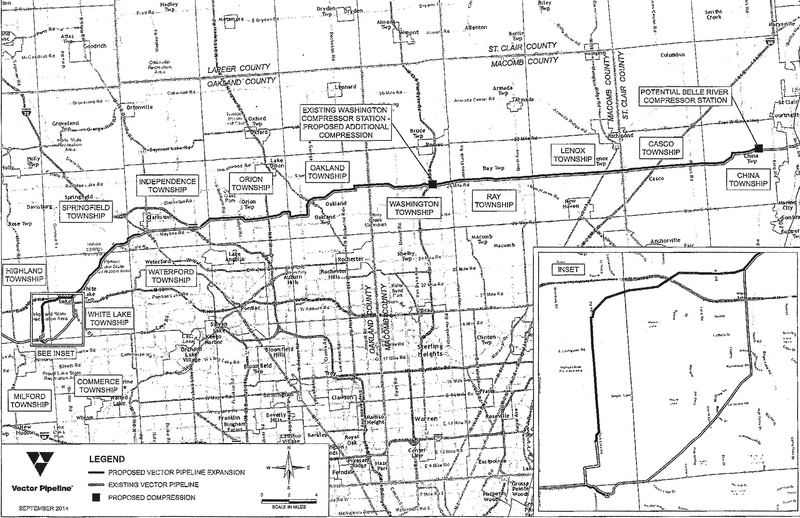 Here is a copy of the map showing the proposed path for the pipeline through Oakland and Macomb Counties. Click on the map to see a larger version of it. Why is this important to the citizens of Oakland Township? Supervisor Gonser did not have the authority to authorize the surveying work. He appears to not be concerned about the impact of a gas pipeline through our Parks. Gonser unilaterally made this decision, totally disregarding the PRC’s stance on this matter. The park land is the PRC’s responsibility, not the Supervisor’s. He did not have any public communication on this matter with other Township Board or PRC members. His lack of knowledge regarding the impact gas lines can have in a community is exemplified by his total disregard for the location of a gas line near his home. As part of an settlement agreement in a personal protection order (PPO) request made by his neighbor against him, he agreed to move a tree that he planted on his neighbor’s property. When Gonser had a company move the tree, a gas line was ruptured. He did not utilize ‘mis-dig’ to locate the line prior to attempting to move the tree. It appears that when Gonser wants to get something done, he does not consider the correct process to be followed, or the potential consequences of his actions. This recent action by our Supervisor is yet another example of his arrogant, authoritarian style. Please click on the words “Supervisor Gonser” in the right portion of this webpage to scroll through and read the many previous posts regarding Supervisor Gonser’s actions. If you find his behavior unacceptable or are concerned about he impact of the pipeline on our park land, please attend the December 9 Board meeting, and express your displeasure with his actions and decision. This entry was posted in Board vs. Parks, Supervisor Gonser and tagged Abuse of Power, Board vs. Parks, Dictatorship, Gonser, oakland township, Oakland Township Parks, Parks and Recreation, Parks Commission, Supervisor Gonser, Supervisor Terry Gonser, Terry Gonser on December 5, 2014 by richardjmichalski.